For all you out there starting the New Year watching what you eat, here is a low-fat cupcake recipe that will blow your spandex away. If you’re already awesome and not on a diet at all you’ll still like this one. This is another of mine that was published in Taste of Home magazine (looks like they toasted the coconut but I don’t when I make this). 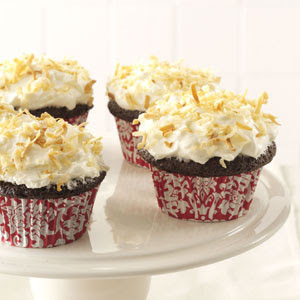 The Coconut Cream Frosting is one of my all-time favorites! I love to frost chocolate layer cakes with it! Prepare cake mix according to package directions for cupcakes, adding cocoa when mixing. Place cupcake liners in a muffin pan and spray with cooking spray (foil liners work the best for this recipe). Fill muffin cups 2/3 full. Bake at 375° for 11-12 minutes or until cake springs back when lightly touched. Cool for 10 minutes before removing from pans to cool completely. For frosting, in a large bowl, combine the sour cream, powdered sugar and extract until smooth. Fold in whipped topping. Frost cupcakes. Sprinkle with coconut. 1 cupcake equals 142 calories, 3 g fat (2 g saturated fat), 3 mg cholesterol, 154 mg sodium, 27 g carbohydrate, 1 g fiber, 3 g protein. Diabetic Exchanges: 1-1/2 starch, 1/2 fat. Hi Kathy! No, that's just good ol' Cool Whip! I'm sorry but I don't know. I just went to the recipe on the Taste of Home website but I can't open it without a subscription (some sort of member exclusive setting has been set since I viewed it last). I'm sure they will have the nutritional information there but I can't view it.